Everything you need to know about the charms of The Nine Tailed Fox. Item builds. team fights, match ups, tips and tricks. Hello, first and foremost allow me to introduce myself: I’m Master, a challenger level mid laner/marksman and this is my guide to mastering Ahri, The Nine Tailed Fox, a must have champion for any main role mid laner’s arsenal. I’ve been playing Ahri since Season 3 and she is one of my favorite champions still to this day, and here you’re going to find out why. I like to think of Ahri as a safe pick in terms of meta shifting issues, since she is mostly skill-shot based champion, she is going to be viable in almost any meta and the LoL competitive scene already proved that with Ahri being played at pro level every season so far. So deciding to pick up and master playing Ahri is definitely a good idea regardless of your ELO. 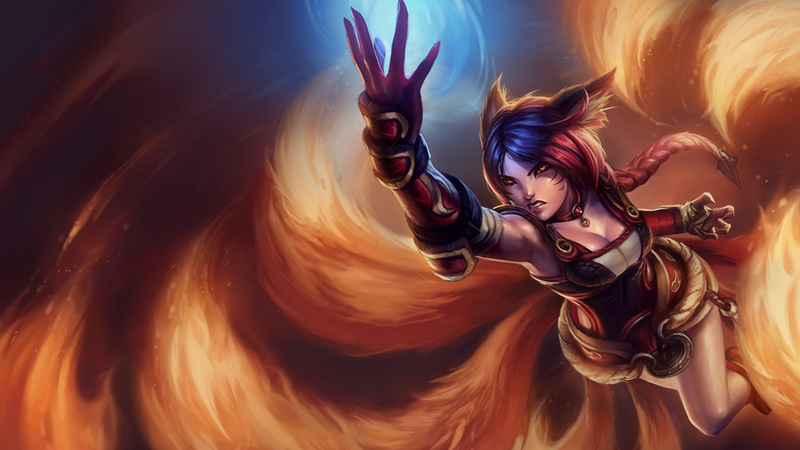 Ahri is mage assassin who excels at every part of the game evenly thus making it a relatively safe pick. Let’s look at Ahri‘s pros and cons! While Ahri is indeed an assassin, i like to build her as more of a control mage, while of course she still has very strong burst & all-in potential as she should have. Even though she can rely on her ultimate, she is still pretty squishy, so i like to start off with Abyssal Scepter against AP opponents, and against AD it’s advised to rush Seeker’s Armguard but it’s not necessary to upgrade to Zhonya’s Hourglass until a bit later. As for boots, Sorcerer’s Shoes are the only way to go. Besides these items that you build for your opponent, you now go focus on the things you need to be a threat. So i like to go with Morello‘s as early as possible, it gives me nice mana sustain & CDR while also providing decent amount of AP. One more item i’d like to add here is Luden’s Echo which i don’t always pick up, even though it’s a great item for Ahri. The reason being is that i play her more as a control mage instead of an assassin, but against certain team compositions & champions, it is indeed a very good item which should always be picked up, however against big tanky opponents, it’s probably not the best option for you. Closing off the game, you rush Rabadon’s Deathcap for huge amounts of AP after the items you already have, and grab Void Staff to top it all of. If you’re not afraid of getting too bursted in the late game, i’d suggest taking Rylai‘s instead of Zhonya‘s as it provides good amount of AP/HP & a slow, and it works beautifully with your AOE spells. Your plan at the very beginning as Ahri is to be in control, so you want to start Q and start pushing/harassing your opponent as much as you can. Make sure to get your Thunderlord’s procs, this will require you to hit one Q sphere and 2 additional auto attacks, it’s deadly and it works, use it. At level 2 you are going to grab Charm and what i like to do is keep it unused as long as possible, so opponent will be anticipating it and wasting time trying to dodge it, during that time you simply land your auto attacks & Q/Ws while keeping your Charm only for a possible all-in & a kill. The most important thing about Ahri‘s laning phase is not to spam abilities meaninglessly, every single spell & mana usage should be calculated to have maximum effect. This is what separates great Ahri’s from good ones. Good Ahri’s use spells to push in & forcibly harrass their opponent, great Ahri’s use them to zone off their opponent, giving them a sweet taste of 400-500 damage each time they try to cs. Keep an eye on whether you hit 6 before your opponent or not, that’s a great chance for you to all-in him without him being able to retreat. – Use spells to zone/harass your opponent and only for that matter. – Hold on to your Charm as long as possible, and use it only if you can follow up with Q/W/R. – Mana is important, don’t waste it on nothing. Make use of every spell. – Keep an eye on level 6, hitting it before your enemy gives you an easy kill potential. When it comes to this stage of the game, your goal is to have perfect teamfight positioning & create chaos in enemy backline. This means you will be lurking on the sides and waiting for your moment to strike. Do not waste your chance by engaging as soon as possible on enemy tanks, be patient and wait for enemy backline to close in, then strike with all your spells on them. There could be an exception of this rule of course, for example when you’re facing assassins on the enemy team, it may be better if you peel back and deal with them to help your Marksman/Team out, and then use remaining of your ult charges to deal with the backline. At this point of the game, you should have your sweeper ready, or if you like to run warding totem like i do, then pick up 2 pink wards and place them on the side bushes where you expect fight to happen. Just remember – avoid the tanks, focus either backline or enemy assassins. Now what’s the deal with this combo? Well, your Charm is a bit delayed, it also starts from your champion’s physical placement, so after pressing Charm button you can flash forward and have a much shorter, un-dodgable Charm which will surprise your opponent and allow you an easy kill. Let’s say you have a ranged minion in front of you, and your opponent hiding behind it, perform the combo i just told you about. Use your charm, then flash through the minion and it will work just perfectly and hit your opponent. You do have to be quick about it though, so i suggest you practice this in custom games. You can also use this in teamfights, flashing through enemy tank/supports in order to get to enemy ADC, without him even realizing what happened. Zed – Harass him. Every single damn time he goes for cs, throw that Q, throw that auto attack in and harass that guy. Also, make sure you save your mana until you have your whole combo ready, then go for it once he’s trying to cs. Zed is not really a hard matchup for Ahri, especially after level 6, at this point you should have your Seeker‘s ready and one thing you should know – Whenever Zed ults, he appears behind you, so time your Charm for that moment and his ult basically gets nullified, he’s even exposed to your full all in. In late game & teamfights, he should be your primary target if Marksman is unreachable, so always make sure to help your own marksman dealing with Zed. LeBlanc – Now this one is a little bit tricky, in fact, there are lots of small duels that you have to win in order to win this matchup. First off, push her in, don’t let her grab that level 2 first, because you can’t return her Q>W combo unless you have charm ready. Remeber one thing when dealing with LeBlanc – When she’s using her W(Distortion) you can Charm her mid-air and deal lots of damage at that point. Next thing, your build is very important here, so make sure to rush that Abyssal‘s as soon as possible. Also, when she goes in you after level 3, you can see that chain coming your way already, so be ready to make a small side-step to dodge it. After level 6, she’s able to poke you with her W>Q>R combo, but after that her ult is out for a while so take that chance to try and land some skillshots. Just make sure you always have your charm ready to stop her once she Distorts into you, and then proceed to strike her with your W & Q, trust me, it’ll hurt her and keep her away for a while. Charm is the key here, so make sure you use it well. Yasuo – Beware early of him, his winning window here is to poke you level 1 before you get your spells, so your plan is to push lane early while standing close to your ranged minions, so when he comes for you, use your minions advantage to poke him, you will deal more damage than he does. Always make sure to use your auto attack to get his shield off before poking with spells. After level 3-4, let him E into you and use your charm behind you to hit him, it’ll leave him open for your combo and potentially a kill if he’s low enough at that point. After level 6 it becomes pretty easy, poke him until you get his Windwall out, then all in him after that. Just always think about his ways of dodging your spells through minions and you’ll always be fine and not miss much. Fizz – This guy will be pretty tanky early on, due to his passive your auto attacks will deal small amounts of damage, but use your Q as your only harass tool and save your Charm & W for when he comes for you. That way you will always out damage him due to your minions + the fact you will be auto attacking him as he is running back to his tower. Just make sure you have your E/W ready for his all in. At level 6, it’s really all about using your ultimate to dodge his R & E & Q and you have plenty of charges, so use them well. And yes, you can dodge his Q if you ult at the right time. Pantheon – Push him hard level one, try to get a good E>Q combo once you hit level 2, after that retreat and be ware of his all-in. Always make sure to be out of range of his stun. He is going to poke you with his spear but you can return that with your Q & auto attacks. You really shouldn’t try to fight him a lot, especially at levels 1-5 as he will out damage & kill you. But once you get level 6 and grab that Seeker’s Armguard, you are ready to fight him. Watch when he uses his spells on minion wave and use that time to strike with your combo. Always push him in so he won’t be able to ult & kill your side lanes. Anivia – Very annoying champion to deal with, especially when you find out her Q>E>AA combo deals 60% of your HP. Make sure you push her in early, her Q is really slow so always be on the lookout and dodge it. Rush that Abyssal to get your MR up so you can deal with her annoying poke, just be patient and wait for your chance with ganks/teamfights, she is immobile and she will die pretty quickly once you get onto her later on. Be patient, dodge her Q and don’t fall for the egg trap when you’re trying to all in her. Ahri is a hard champion to master, but once you do, there’s no limit on how far you can go and the stuff you can do. The more games you play, you will get a hand of how to use her spells correctly, as well as how to position in teamfights. As the old saying goes – Practice makes perfect, so don’t be too discouraged if you fail early on with Ahri, it’ll take time but after you put in some time and research you will have one of the best champions in your hands, and you will be able to do amazing things with it. Give the Fox a try and i promise you won’t be disappointed with her charms. That was it from me for today, i’ll be back in future with more guides on my favorite champions, meanwhile if you’re looking to improve your ranking or get some coaching, feel free to hit me up and i’ll do my best to help you! Very detailed and informative guide, I played Ahri as one of my top 3 champs in Ranked and have lots to learn about the champ based on the excellent guide you provided for me and, the rest of the people who are trying to climb higher. I absolutely adore Ahri. I just want to know, what do you mean control mage ? And what do you think about ludens and lich bane ? Lich bane is really bad compared to other things you can get on her. Luden’s is great if you’re going to play full assassin-like style, but when you that route you are fairly squishy and easy to kill (That’s why Abyssal & even Rylai’s come in handy). And when i said control mage, it basically means playing as if you were the AD Carry, trying to survive as long as possible and do as much damage, instead of just all-inning and dying right after. Thank you very much! Glad that you like i! Would charm still be better to max second or could you max Foxfire second instead of charm? Hello Huli, very sorry for the late reply. I was a really huge player from the S3 assassin meta all the way to S6. However, recently i started playing a bit more AD than usual so i have less Ahri games overall.